BlackFireWax.com offers a large selection of microfiber and terry cloth polishing bonnets. These bonnets make applying and removing waxes and paint sealants extremely easy. Our microfiber bonnets are made from high quality, premium grade, microfiber material. Our terry cloth bonnets are made from soft, 100% cotton. Slip these bonnets over an appropriate sized foam or lamb's wool leveling pad to turn your dual-action polisher into a wax removal machine. Use a lower speed, between 2 to 4, on most dual action polishers, to gently remove waxes and paint sealants. This is the easiest way to reveal your paint's true shine. All of our bonnets are double sided and machine washable. When one side of the bonnet becomes loaded with product, simply remove it , turn it inside-out, and reattach. When both sides of the bonnet are loaded with product residue you can throw them in the washing machine with your other microfiber products. Wash with a high quality microfiber cleanser such as BLACKFIRE Microfiber Cleaner & Restorer then air dry or machine dry on low heat. At the end of a long detailing session, our bonnets will save you time and energy by letting the machine do the final buffing for you. 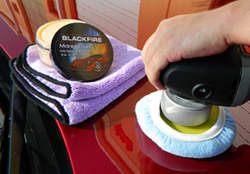 Enjoy a perfect, streak free shine in less time, and spend more time showing off your shine with the help of BlackFireWax.com's vast bonnet selection.